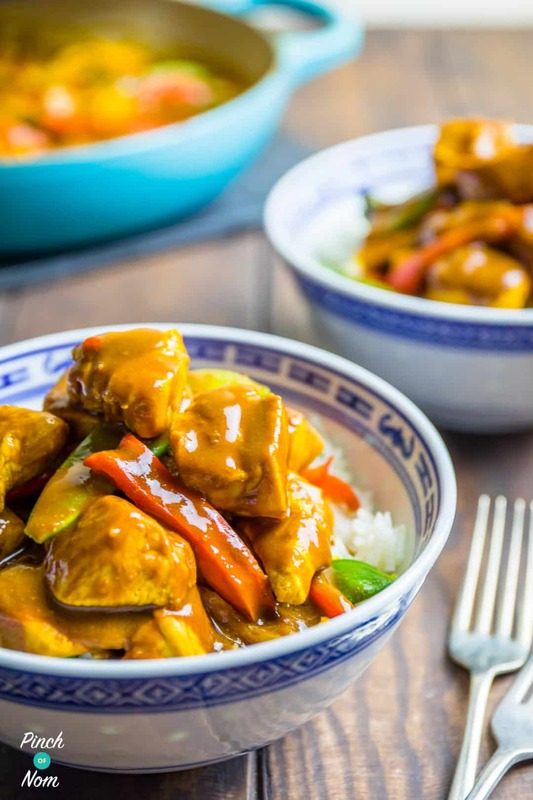 This is our Slimming World, Weight Watchers and Calorie Counting friendly version of a delicious Chicken Satay Curry – who needs the Takeaway? We love Satay. But as with everything we love, it’s not very slimming friendly. So we decided to come up with our own Chicken Satay Curry fakeaway recipe is not only Slimming World friendly, but Weight Watchers too! I actually think this is one of my all time favourite curries. It’s just lush, especially if you’re a fan of peanut butter, or nuts in general! 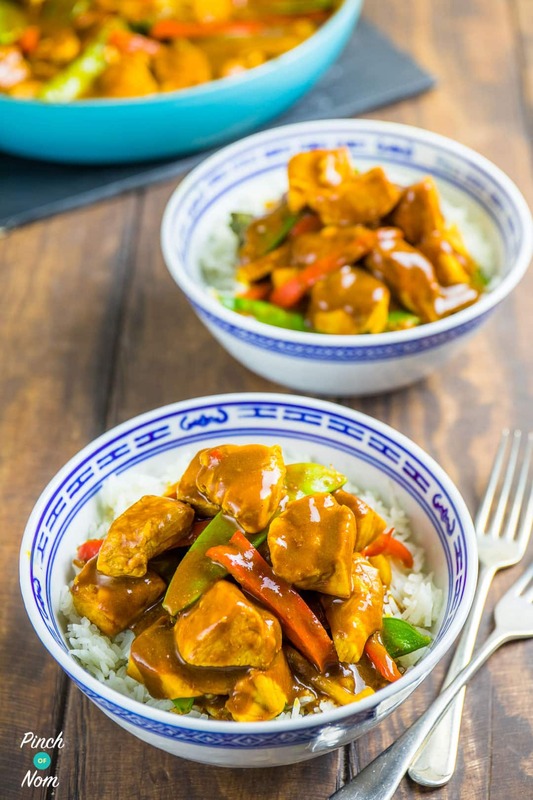 How many Syns are in this Chicken Satay Curry? This Chicken Satay Curry uses the coconut drink as part of one of your Healthy Extra A allowances. It’s pretty easy to work it out because you’re using 100ml of your 600ml allowance per portion. However, if you choose to Syn the coconut drink it’s 1 Syn per 100ml. This means that the total Syn value of this recipe is 12, so that’s 2 Syns per portion. You can also add a sprinkling of chopped salted peanuts on top, but don’t forget to syn it!! The recipe for this Chicken Satay Curry uses 3 tablespoons of sweetener in the sauce and is divided into 6 portions. That’s 1/2 a tablespoon per portion, so there’s no need to add any Syns on for the sweetener itself. If you leave out the peas, and serve this recipe with a suitable accompaniment, then this Chicken Satay Curry is suitable for Slimming World Extra Easy SP. 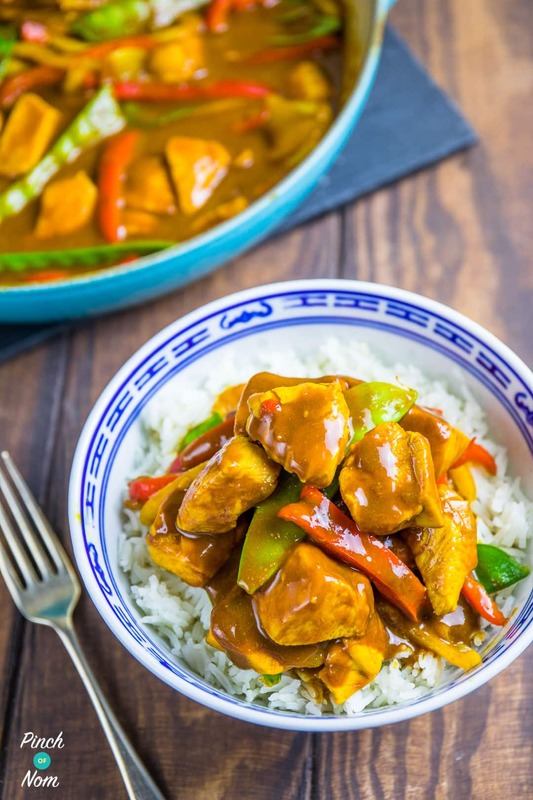 How Weight Watchers friendly is this Chicken Satay Curry recipe? A takeaway version of this recipe could have more than 18 Points per portion! Our Weight Watchers friendly version has just 3 Smart Points per portion. That leaves you plenty of Points for accompaniments like rice! 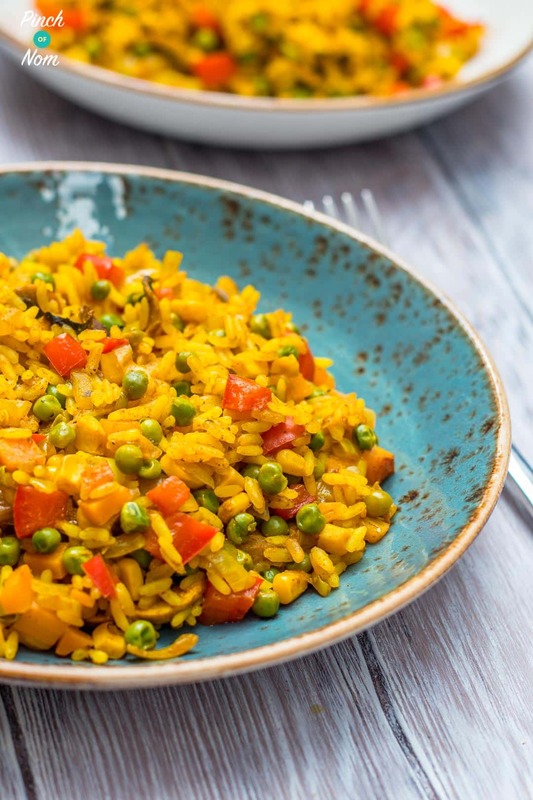 Why not try our Savoury Rice with it? How many Calories are in this Chicken Satay Curry? 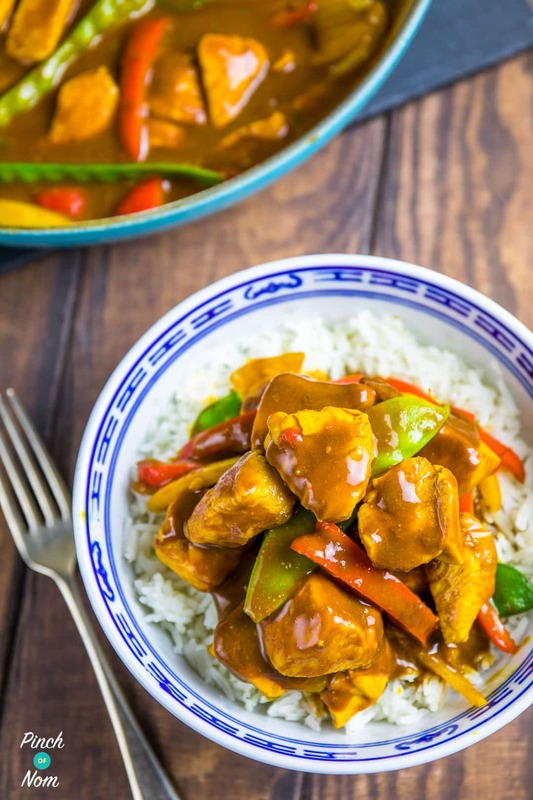 This Chicken Satay Curry has considerably less calories than a restaurant version – but doesn’t compromise on flavour. Our recipe has less than 300 Calories per portion! We’ve been trying to make a Low Syn, Low Point and Low Calorie Chicken Satay Curry recipe for quite a while now. In fact we tried a different version about a week ago, but we’ve never got it quite right. It would either be not peanutty enough or ridiculously high in Syns, Points and Calories. 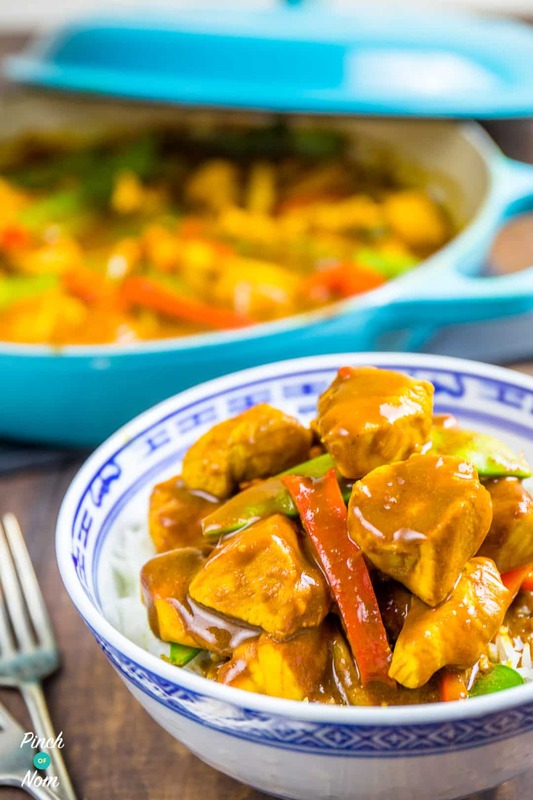 The Chicken Satay Curry we’ve come up with is pretty damn close to the takeaway version, and, as usual our version is packed full of speed food! The problem with the traditional Chicken Satay Curry is that it usually contains a load of peanuts or peanut butter, coconut milk and oil. All of which contribute to the massive Syn, Calorie and Point count in the dish. So how do we make Satay Curry more slimming friendly? First we replaced the coconut milk with the Longlife Alpro Coconut Drink. You can have 600ml of this for one of your HEA, which means that you can either Syn it or use it as 1/6 of one of your HEA allowance. Next, we switched the oil for a low calorie cooking spray. Doing this can replace a 6 Syn ingredient (yes most oils are 6 Syns per tbsp!) for a Syn free alternative. Finally, we replaced the peanut butter with something called PB2. 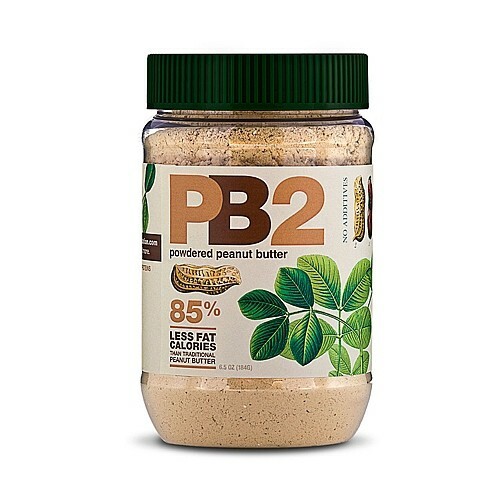 PB2 is a powdered peanut butter, and it’s made with peanuts that are slow-roasted and pressed to remove the fat. It’s all natural, no artificial sweeteners or preservatives. It even has the same consistency and flavour of full-fat peanut butter, when mixed with double the amount of water, but with more than 85% less fat. Normal peanut butter is around 4.5 Syns per tbsp, but PB2 is an incredible 1 Syn per tbsp. You can find it on Amazon, and they even make a Chocolate Peanut Butter version. Obviously it’s not suitable for this recipe, but it’s well worth knowing about. We use PB2 in quite a few of our recipes! 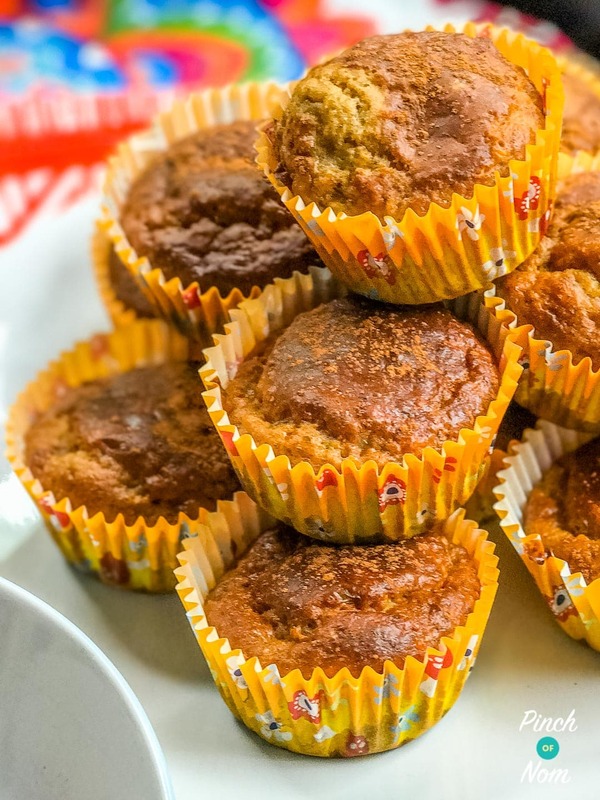 Why not try our Banana and Peanut Muffins? 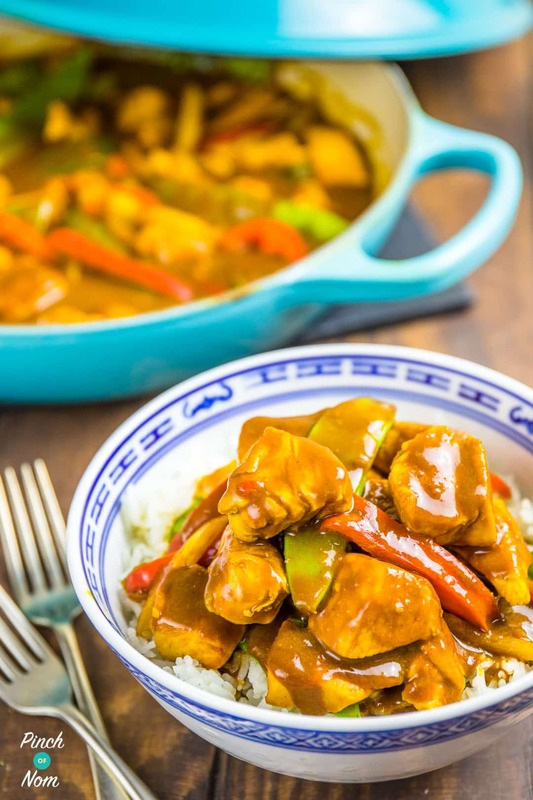 Some of you love this Chicken Satay Curry recipe! 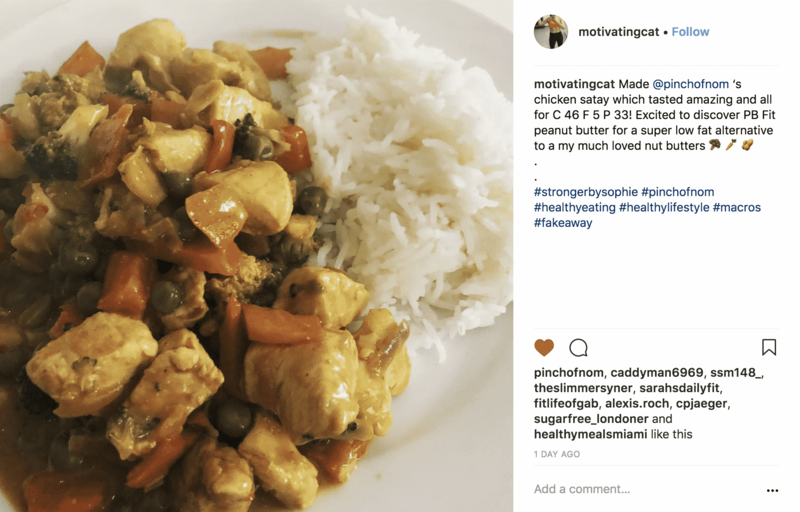 One of our Instagram followers @motivatingcat made this dish and loved it! How do I make this Chicken Satay Curry? I’m not sure what you think might be a tweak in this recipe Anne? One things I do know is that it’s delicious! This was really nice. Will have again. Even my ten year old liked it. This was so yummy . Whole family loved it . Will definitely be cooking it again ???? Hi there. I haven’t made this yet but just wondering if it’s suitable for freezing? Thanks ???? This is totally delicious!! Thank you ???? Giving this a go at the mo, is there any reason you cannot use ground fennel, cumin and coriander seeds? Absolutely delicious! Has been added to the regular favourite recipes! Added babycorn for extra speed and served with noodles… Best thing I’ve cooked in a while!! This recipe is amazing! New ingredients for me in terms of PB2 and the alpro milk but now I know what I’m doing this will be a staple in our house! Thanks for the delicious treat, you guys are wonderful! Made this tonight…..O to the M to the G….it was amazing was a piggy and had 2 portions…Thank you. Is it possible to replace the corn flour with xanthan gum? I was wondering this too, does anyone know?? Made this and my other half loved it. Would it be ok to double the sauce mix and freeze half? Would then make a quick meal when coming in from work. I can only see PPB on the SW syn list which says it’s 1.5 syns per tbs. Is PB2 definitely 1 syn per tbs? You need to search for “Bell Plantation” on the app 🙂 Yup it’s 1 syn per TBSP. This is INCREDIBLE. Tastes absolutely like Satay sauce from our local takeaway. I made it and served over Singapore noodles with SW chips… It tasted every bit as good. If you’re not sure whether to give this a try, DO IT. It will not disappoint! So glad you liked it. Occasionally recipes don’t turn out quite as planned, and sometimes they do, but this one really did turn out way better than we ever thought it would. Tried this tonight and I must say it was absolutely amazing. Thanks so much pinch of nom. Please tell me that the sauce is suitable for home freezing? Can you use normal smooth peanut butter from the shops instead of the pb2? Another one to add to my ever increasing list of favourites. Love this recipe. So easy to make yet so good. omg made this this evening, it tasted exactly like the takeaway. my husband loved it. thanks so much for sharing the recipe. Hi Andrea, thanks for the feedback. Glad you enjoyed it! Haha sounds like you had an interesting time! But so glad you enjoyed it in the end! Yep! It’s really that easy! I have this on my menu this week. Can’t wait as all I hear is fantastic feedback. Now the question to all those who have tried it… do you put the peanut garnish on for syns or rather leave them out? Is is better with them? Can’t wait to try your recipe tomorrow night ! Is this gluten free or can it be made so? Looks amazing! So glad you enjoyed it, Alison! So glad you enjoyed it, Vic! It’s a big favourite in our house too! I made this last Friday night; me and my kids loved it. I also gave some to a couple of friends to try and they too thought it was delicious. Would definitely make again, and again!!! Hi, what sweeteners is best to use? We always suggest a granulated sweetener, rather than powdered ones. Sukrin is our preferred choice, but Canderel Sugarly or Natvia are suitable too. 4tbsp powder to 8tbsp water does not make a paste and is not the right ratio according to PB2. Do I follow your instruction which makes water or the PB2 instruction which makes a paste? The instructions on the jar are to reconstitute it as peanut butter, which is pretty thick and claggy in texture. We’re making a coating sauce for this recipe, so it needs to be runnier, hence the extra water. Hi, this looks lovely! The veg in the recipe doesn’t match the picture though – no peas or broccoli or carrots.? Looks like mange tout and peppers, has the recipe changed since the picture was taken? I was wondering if the carrots were supposed to be part of the sauce and therefore blended in or not. Absolutely amazing! I used powdered spices, didn’t liquidate, used coconut oil spray, no sweetener, no cornflour, a splash of sweet chilli sauce, and used soy milk. So glad you enjoyed it, Lorna. It’s a big favourite in our house!! Oh my word, we absolutely loved this recipe thank you. Can anyone recommend an alternative to the coconut drink – I’m allergic to coconut. Could I use almond milk instead? Absolutely banging recipe!! Surely it would be 2 syns per portion though? I use PBFit (1.5 Syns per level tbsp) instead of PB 2 (1 Syn per level tbsp) , to all intents and purposes it’s the same product. I just adjust the Syn value accordingly, but it’s soooo worth it for this recipe! Would this recipe be possible in the slow cooker crock pot? This recipe could be made in the slow cooker, but you would need to prepare the satay sauce on the hob to cook out the spices, otherwise you won’t get the right flavour. Once the sauce is made, you could make the rest of the recipe in the slow cooker. Hope that helps! You can get PB Fit powdered peanut butter in larger Sainsbury’s and Asda stores, which is very similar to PB2 and work well in this recipe. You can also order from Ocado and Amazon. Just want to say thank you for this recipe, I made it with both chicken and salmon and it was lush. Well worth the effort, Although I did end up wearing it when I blended it. So glad you enjoyed it, Lynn! We love this one, too! Is there any particular sweetener that you recommend? We recommend the Sukrin range, as they are comparable with sugar in weight and taste. Other good alternatives are Canderel Sugarly in the blue jar, or Natvia.